I’d like you to take a moment to read the Ava Rosemeyer story. It’s very, very sad and reading it left me in tears. But it’s also a very brave message from Ava’s parents to other parents about safety and cherishing life. Ava was like so many three-and-a-half-year-old girls – she loved pink, fairies, ballerinas and all things sparkly. Ava had a loving family and enjoyed living right next door to her beloved grandfather. In 2007, Ava had a tragic accident. Unbeknownst to her family, Ava locked herself in the car. It was a very hot day and she was in the car for up to thirty minutes before her frantic mother found her. What followed is every parents’ worst nightmare – Ava was rushed to hospital where she was put on life support, cooled down in an attempt to limit brain damage and placed in an induced coma until she could be stabilised. 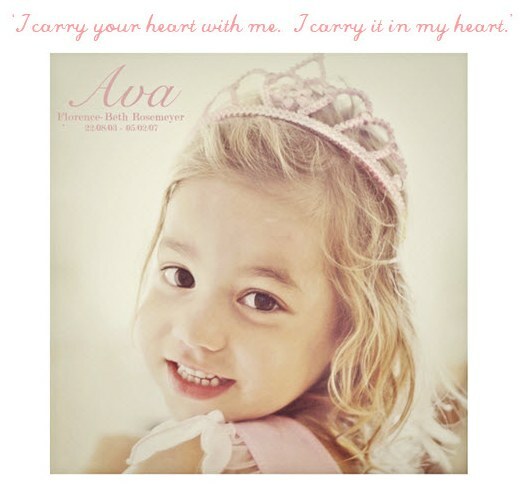 Despite all that was being done, Ava’s little body could not fight on and she died two days later. Amongst the many things her family didn’t get the chance to share with Ava was a tea party. A proper, best frocks with socks and ribbons-in-hair tea party. In 2008, Sheye Rosemeyer approached Mandy Sutcliffe from Belle & Boo about the idea of creating an illustration of how they’d imagined Ava’s Tea Party would have looked. Mandy created something beautiful – the Ava’s Tea Party collection. 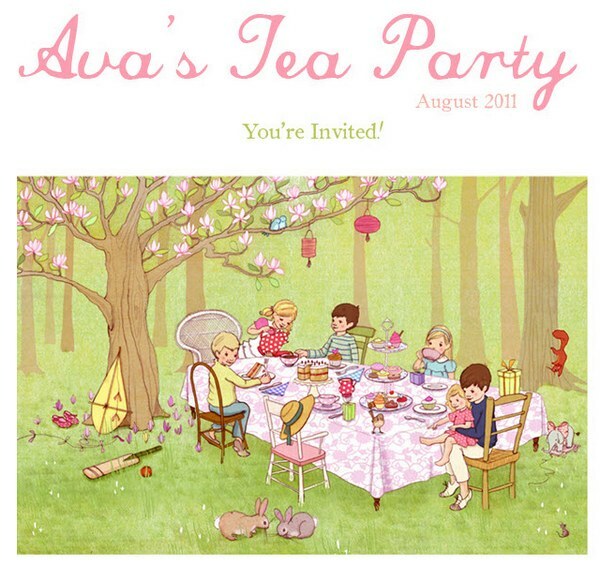 In 2009, the Rosemeyers decided to hold their tea party for Ava. They marked her birthday, 22 August, with cupcakes and spotty plates, surrounded by friends and family. Sheye invited the blogging community to do the same, in whatever way they wished, with the idea being to simply appreciate and cherish their loved ones. 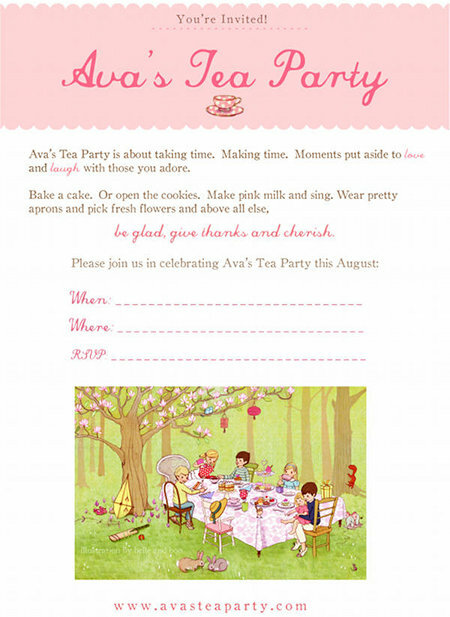 The blogging community responded and so the idea of an annual Ava’s Tea Party was born. Ava’s family hope to inspire people to spend simple time with loved ones and are encouraging people to hold their own tea party on or around 22 August. Although their focus is on cherishing time with family and friends, the Rosemeyer’s support fundraising for Paradise Kids, a community organisation that helps families through grief and loss. Paradise Kids helped the Rosemeyers in the dark days after losing Ava. In addition, so many talented and generous designers, retailers and others have supported Ava’s Tea Party and it promises to grow bigger every year. So, as 22 August approaches, have a think about hosting a tea party – it can be as simple as pink milk and crumpets with your family or an all-out playgroup gathering with the ‘best’ china – the important thing is to take the time. Download your free printable A4 poster and A5 flyer to accent your special event.